Welcome back to the Thistle & That blog! 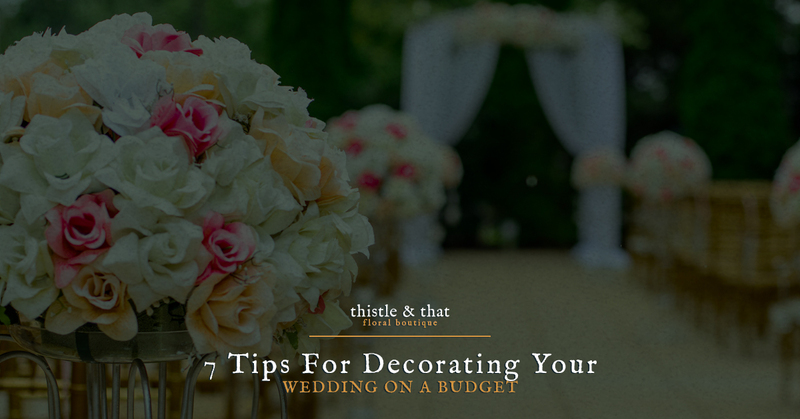 Lately, we have been covering all things related to doing your wedding on budget. Weddings are expensive, but you don’t have to break your bank account or go over your budget. You can still create a beautiful setting for your wedding and reception using inexpensive decorations that look elevated and with DIY wedding flowers. Keep reading to learn more about effective ways to decorate your Dallas wedding or visit the Thistle & That website to learn more about our wholesale fresh flowers and online classes we offer that make creating beautiful floral arrangements easy. It’s easy to think that you have to have extravagant decorations to really wow your guests and create the most beautiful wedding. However, decadence isn’t a must. Simple, thoughtful decorations like centerpieces made simply of a candle and pretty fresh blooms can be enough. Love the smell of fresh lavender or rosemary? Incorporate a small sprig into each place setting for your guests. They will enjoy the simple setting and a fresh, relaxing fragrance as well. Minimal decorations can carry as much decorative “punch” as those that are more elaborate. It’s easy to get caught up feeling like your wedding decorations have to be all glitz and glam, but they can be sentimental, too! Create a wall of pictures featuring you as a couple throughout your relationship, or show off your engagement photos. People love learning more about the couple that they are celebrating, and even if they know your love story, they will enjoy hearing it over and over again. Is family important to you? Create a tribute to the great marriages of your family with an arrangement of family wedding photos. Not big on family? Consider creating a collage of wedding pictures of celebrated celebrity weddings. Adding lights to your wedding is an inexpensive way to create a beautiful ambiance for your wedding and the options are endless. Use simple white Christmas lights or check out the outdoor light selection at your local superstore or home improvement store. Lanterns and candles can be another great way to create a beautiful setting. Instead of using real candles, opt to use battery powered candles that you can trust won’t create a smokey accident and will stay lit all night long. Another option includes investing in secondhand or inexpensive lamps. These can make each table feel intimate and are extremely easy to set up. Fabric arranged in an artful or intentional way can create a beautiful effect for your wedding ceremony space and your reception area. Drape sheer material from the rafters. Choose white or ivory for a sophisticated look, or choose a bright color that matches or compliments your wedding colors. Instead of draping large pieces of fabric, consider using streamers or smaller pieces of fabric that can act as streamers. Hang them like you would traditional streamers or create a modern look with a multiple colored streamers hung together. A water feature can be a powerful way to create ambiance and another simple, inexpensive way to decorate your wedding. An effective water feature can be something as simple as a table top one that you would find at your local crafts store. Set one on a table with your guest book at the entrance of your wedding or your reception. There are many inexpensive ways to effectively create ambiance at your wedding. DIY wedding flowers may make you think of ugly fake flowers that your aunt has “planted” in her front garden. However, DIY wedding flowers can be so much more. Using a traditional wedding florist can be incredibly expensive and quickly put you over budget. Instead of going over budget or compromising and creating your bouquet of fake flowers, DIY your own wedding flowers with fresh blooms from Thistle & That! We offer wholesale fresh flowers and a online class with world-class florist David Kimmel. Get your flowers at an affordable cost and the know-how to create beautiful arrangements. Learn more about Thistle & That and the DIY wedding flowers we offer to brides of the Dallas area on our website.